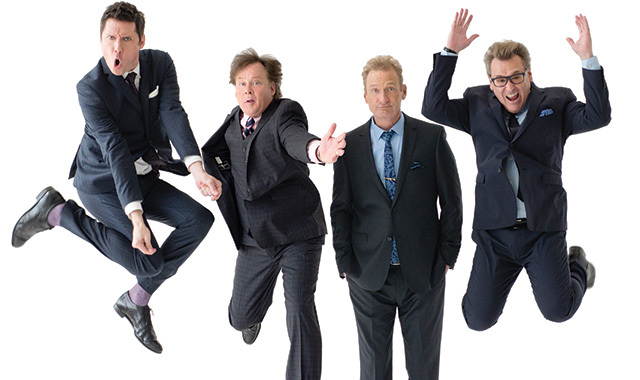 Laugh along with the improv antics of the “Whose Line is it Anyway?” crew at Rockford’s Coronado Performing Arts Center on Oct. 5. Through Aug. 25, Tues.-Fri. 10 a.m.-5 p.m., Sat. noon-5 p.m. Showcasing the works of three generations of artists, with three unique styles of art expression. Duane Smith’s work focuses on the Illinois landscape, his daughter Paula specializes in sculptures of reclaimed treasures and grandson Peter’s work brings awareness of self-expression for artists with autism. Freeport Art Museum (FAM), 121 N. Harlem Ave., Freeport, (815) 235-9755, freeportartmuseum.org. Through Aug. 28, Tue. 5 p.m. gates open, 5:45 p.m. performance. Join friends and family for an evening of live music in a beautiful outdoor setting. Picnics allowed (no beverages), and food and beverages available for purchase. Anderson Japanese Gardens, 318 Spring Creek Road, Rockford, (815) 229-9390, andersongardens.org. Through Sept. 2, see website for times. The beautiful mermaid Ariel, King Triton’s youngest daughter, longs to leave her ocean home to live in the world above. The Fireside Dinner Theatre (Fireside), Business Hwy. 26 South, Fort Atkinson, Wis., (800) 477-9505, firesidetheatre.com. Through Sept. 14, most Fridays 6:30-8:30 p.m. Local musicians perform their latest tunes on the plaza. Seating is limited, so bring a chair. May be cancelled in inclement weather. Edgebrook Shops, 1639 N. Alpine Road, Rockford, (815) 226-0212, edgebrookshops.com. Through Sept. 30, daily 10 a.m-5 p.m. The juried exhibition showcases multimedia work by contemporary artists across the Midwest. Rockford Art Museum (RAM), 711 N. Main St., Rockford, (815) 968-2787, rockfordartmuseum.org. Through Nov. 11, daily 10 a.m.-5 p.m. Photographs by Estonian artist Uibopuu feature people and places in Estonia, New York and Rockford. RAM, Rockford, (815) 968-2787, rockfordartmuseum.org. Aug. 16-Sept. 8, Thu.-Sat. 8 p.m. Meet the Joneses, two suburban couples with identical homes and shared last names. As their relationships intertwine, they must decide between their idyllic fantasies and their imperfect realities. [usual]Suspects, Nordlof Center, 118 N. Main St., Rockford, rockfordpubliclibrary.org. Aug. 16 & Sept. 13, 11 a.m. Meet in the lobby of Nicholas Conservatory and Gardens to take a guided walk along the bike path as you learn about the 16 sculptures on the trail, some by local artists and some donated to the Park District. Nicholas Conservatory & Gardens, 1354 N. 2nd St., Rockford, (815) 987-8858, rockfordparkdistrict.org/ncg. Aug. 18, 7 p.m. His work is an anthem to the people who live, work and play along the freshwater highways of North America. Spring Creek United Church of Christ (UCC), 4500 Spring Creek Road, Rockford, (815) 877-2576, springcreekucc.org. Aug. 19, 6 p.m. Grounds open 4 p.m. Bring a blanket and picnic dinner, relax and enjoy the music of this eight-piece band, influenced by Chicago blues and New Orleans funk. Klehm Arboretum and Botanic Garden, 2715 S. Main St., Rockford, (815) 965-8146, klehm.org. Aug. 21, 5:30-7:30 p.m. Back by popular demand, the Brothers Quinn play folk and Americana music. Rotary Botanical Gardens, 1455 Palmer Dr., Janesville, (608) 752-3885, rotarybotanicalgardens.org. Aug. 22, 6-8 p.m. The Rockford singer/songwriter entertains with haunting indie-flavored country meditations. Nicholas Conservatory & Gardens, Rockford, (815) 987-8858, rockfordparkdistrict.org/ncg. Aug. 23, 7:30 p.m. An original play by local playwright Jim Lyke about homelessness in Rock County, inspired by stories of individuals and available resources in the community. Janesville Performing Arts Center (JPAC), 408 S. Main St., Janesville, (608) 758-0297, janesvillepac.org. Aug. 24-Sept. 9, Fri.-Sat. 8 p.m., Sun. 2 p.m. A comedy of suspicion in which nothing is ever quite what it seems. Matthew’s wife, Lisa, seems to be having an affair with Adrian, a British theatre director. Is the affair part of the play being rehearsed or is Matthew making it up to have something to report to his therapist? Pec Playhouse Theatre, 314 Main St., Pecatonica, Ill., (815) 239-1210, pecplayhouse.org. Aug. 25, 7 p.m. Music ranging from Classical and Jazz to Rock, Blues and Folk. Spring Creek UCC, Rockford, (815) 877-2576, springcreekucc.org. Aug. 29, 6-8 p.m. Local singer/songwriter Earlywine incorporates familiar classics from the ’50s and ’60s for a night of easy listening. Nicholas Conservatory & Gardens, Rockford, (815) 987-8858, rockfordparkdistrict.org/ncg. Sept. 1, 7 p.m. From DeKalb, Ill., the birthplace of barbed wire, this group has a jazzy style described as Hot-Swing-Traditional with a dash of New Orleans sass. Spring Creek UCC, Rockford, (815) 877-2576, springcreekucc.org. Sept. 2, 10 a.m.-5 p.m. The festival includes fine art displays, performing arts, demonstrations of various art media, children’s hands-on activities, music and food concessions. Freeport Art Museum, Krape Park, 1799 S. Park Blvd., Freeport, (815) 235-9755, freeportartmuseum.org. Sept. 5, 6-8 p.m. The trio performs traditional, smooth and original jazz compositions in a class/vintage night club swingin’ style. Nicholas Conservatory & Gardens, Rockford, (815) 987-8858, rockfordparkdistrict.org/ncg. Sept. 6-23, Thur.-Sat. 7:30 p.m., Sat. 2 p.m., Sun. 4 p.m. In this comedy, Liz has a new man in her life and her friends want to be supportive, but for the nagging suspicion that he is a serial killer. Artists’ Ensemble (AE), Cheek Theatre, Rockford University, 5050 E. State St., Rockford, (815) 394-5004, artistsensemble.org. Sept. 6-Oct. 28, see website for times. The fabulous record-breaking musical tribute to the ’50s is full of ducktails, hot rodders, bobby socks, pedal pushers and tunes that recall the music of Buddy Holly, Little Richard and Elvis Presley. Fireside, Fort Atkinson, Wis., (800) 477-9505, firesidetheatre.com. Sept. 8, 9 a.m.-6 p.m. A family-friendly festival featuring an artist market, art demonstrations, a make-and-take creative zone, live music and specialty food vendors. Rockford Area Arts Council, City Market Pavilion, 100 Water St., Rockford, (815) 963-6765, artsforeveryone.com. Sept. 8, 7 p.m. Arch Smith is back with finely honed magical skills; John Lindhorst plays his ukulele melodies. Spring Creek UCC, Rockford, (815) 877-2576, springcreekucc.org. Sept. 8, 7:30 p.m. A tribute to the four men who stood at the center of the advent of rock ‘n’ roll. Egyptian Theatre, 135 N. 2nd St., DeKalb, Ill., (815) 758-1215, egyptiantheatre.org. RSO: Farkle and the Wolf! Sept. 9, 3 p.m. A family-friendly matinee exploring instruments of the orchestra, through John Lithgow’s “The Remarkable Farkle McBride” and Prokofiev’s “Peter and the Wolf.” Rockford Symphony Orchestra, Starlight Theatre, Rock Valley College (RVC), 3301 N. Mulford Road, Rockford, (815) 921-2160, rockvalleycollege.edu. Sept. 12, 6-8 p.m. Best known for light rock, classic pop and blues. Nicholas Conservatory & Gardens, Rockford, (815) 987-8858, rockfordparkdistrict.org/ncg. Sept. 14, 7:30 p.m. The principal clarinetist of the Chicago Symphony Orchestra was a featured soloist for John Williams’ score for the film “Lincoln.” Mendelssohn Performing Arts Center (MPAC), Mendelssohn Hall, 406 N. Main St., Rockford, (815) 964-9713, mendelssohnpac.org. Sept. 15, 7 p.m. Join Rockford’s own Vince Chiarelli and his band for an evening of Italian music with a modern twist. Spring Creek UCC, Rockford, (815) 877-2576, springcreekucc.org. Sept. 15-17, 10 a.m.-6 p.m. The 70th annual art fair features local and nation artists, live music, local and regional vendors, children’s art activities, along with food and drink. RAM, Rockford, (815) 968-2787, rockfordartmuseum.org. Sept. 19, 6-8 p.m. Incorporating classic rock, country, blues, gospel, jazz, Latin and Celtic music. Nicholas Conservatory & Gardens, Rockford, (815) 987-8858, rockfordparkdistrict.org/ncg. Sept. 20, 7 p.m. From previous careers, these four friends launched their quartet after appearing on “America’s Got Talent.” Sauk Valley Community Concert Association (SVCCA), Dixon High School, Lincoln Statue Dr., Dixon, Ill., (815) 288-2501, svcca.org. Sept. 20-30, Fri.-Sat., 7:30 p.m., Sun. 2 p.m. While on vacation in London, Canadian Robert Hannay becomes embroiled in an international spy ring and is accused of murder. Stage Coach Players, 126 S. 5th St., DeKalb, Ill., (815) 758-1940, stagecoachers.com. Sept. 21, 8 p.m. This internationally acclaimed Irish folk quartet plays 13 instruments among them, entertaining with new songs as well as old favorites. Egyptian Theatre, (815) 758-1215, egyptiantheatre.org. Sept. 21-Dec. 21, Fri. 7 p.m. Sofia Talvik, Rupert Wates, Blues Boys, Emily Hurd, Marques Morel and Andrew Holm are some of the upcoming performers. Listening Room, 201 7th St., Rockford, (815) 965-8903, rockfordlisteningroom.com. Sept. 22, 7 p.m. Dvorak’s country style combines blues, folk, rock and Celtic. Spring Creek UCC, Rockford, (815) 877-2576, springcreekucc.org. Sept. 22-23, Sat. 7:30 p.m., Sun. 2 p.m. Special guest violinist Pickart plays romantic masterworks. Beloit Janesville Symphony (BJSO), Eaton Chapel, Beloit College, College and Chapin Streets, Beloit, (608) 313-1200, beloitjanesvillesymphony.org. Sept. 24, 5:30 p.m. Woodwind music for flute, clarinet and bassoon. MPAC, Emerson House, 420 N. Main St., (815) 964-9713, mendelssohnpac.org. Sept. 27-30 & Oct. 4-6, Thur.-Sat. 7:30 p.m., Sat.-Sun. 3 p.m. Charles Schulz’s comic strip comes to life in this musical, with Lucy, Schroeder, Sally, Snoopy, Linus and, of course, Charlie Brown. Beloit Civic Theatre, Elizabeth Reinholz Theatre, Beloit Memorial High School, 1225 4th St., Beloit, (608) 362-1595, beloitcivictheatre.org. Sept. 28, 7:30 p.m. Two professional entertainers play and sing audience requests; dancing and beverages round out the evening. JPAC, Janesville, (608) 758-0297, janesvillepac.org. Sept. 29, 7:30 p.m. Sample some craft beer and relax with an evening of acoustic music at this celebration of the Wisconsin singer/songwriter community. Proceeds support ongoing improvements to the JPAC facility. JPAC, Janesville, (608) 758-0297, janesvillepac.org. Sept. 30, 7 p.m. The quintet plays a blend of pop, punk, and rock and roll. Their multi-platinum hits include “Rhythm of Love,” “1,2,3,4,” and “Hey There Delilah.” Egyptian Theatre, DeKalb, Ill., (815) 758-1215, egyptiantheatre.org. Oct. 4-7, Thur.-Sat. 7:30 p.m., Sun 2 p.m. Carrie is a lonely, awkward teenage girl with telekinetic powers who unleashes her wrath after being humiliated at the high school prom; adapted from the Stephen King novel. Artists’ Ensemble, Cheek Theatre, Rockford University, 5050 E. State St., Rockford, (815) 226-4100, artistsensemble.org. Oct. 5, 8 p.m. Bring your suggestions for “Whose Line is it Anyway?” cast members to turn into improvised comedy and songs. You may be asked to join the cast onstage. Coronado Performing Arts Center (Coronado PAC), 314 N. Main St., Rockford, (815) 968-0595, coronadopac.org. Oct. 6, 7 p.m. Known throughout Europe and the U.S., guitarist Bourbon performs in blues, Spanish and Middle Eastern traditions. Spring Creek UCC, Rockford, (815) 877-2576, springcreekucc.org. Oct. 6, 7:30 p.m. Experience the action-packed film that pits man against prehistoric predators, projected in HD with the orchestra performing John Williams’ score. Rockford Symphony Orchestra (RSO), Coronado PAC, Rockford, (815) 965-0049, rockfordsymphony.com. Oct. 6, 7:30 p.m. Irish musicians find common ground between Old World tradition and authentic Americana by plying their banjo, fiddle, guitar and mandolin in a fusion of styles that they dub “Celtgrass.” JPAC, Janesville, (608) 758-0297, janesvillepac.org. Oct. 6-7, Fri. 5-9 p.m., Sat. 4-9 p.m. The Rockford Area Arts Council presents the 30th Annual Fall ArtScene, showcasing original works of art at 40 locations across Rockford. Various locations, Rockford. Info/maps: Rockford Area Arts Council, (815) 963-6765, artsforeveryone.com. Oct. 21, 8 p.m. This classic rock band brought country music to the mainstream and charted 43 No. 1 singles, including “My Home’s in Alabama,” “Tennessee River,” and “Forever’s as Far as I’ll Go.” BMO Harris Bank Center, 300 Elm St., Rockford, (815) 968-5222, thebmoharrisbankcenter.com. Oct. 12-21, Fri.-Sat. 7:30 p.m., Sun. 2 p.m. In the 1920s, a Tennessee schoolteacher is put on trial for violating a law that prohibits public schools from teaching evolution. Two of the nation’s leading lawyers go head-to-head. Stage One, JPAC, Janesville, (608) 758-0297, janesvillepac.org. Oct. 13, 9 a.m.-4 p.m. Ride in a covered wagon, visit with farm animals, bob for apples and decorate pumpkins. John Deere Historic Site, 8334 S. Clinton St., Grand Detour, Ill., (815) 652-4551, deere.com. Oct. 13, 7:30 p.m.; pre-concert talk by the music director at 6:30 p.m. Kishwaukee Symphony Orchestra (KSO), NIU Boutell Concert Hall, 550 Lucinda Ave., DeKalb, Ill., (815) 756-3728, kishorchestra.org. Oct. 14, 3 p.m. The jazz-fusion band from Rockford draws on musical styles ranging from blues and funk to swing and Afro-Cuban. MPAC, Starr Center, 415 N. Church St., Rockford, (815) 964-9713, mendelssohnpac.org. Oct. 14-15, Sat. 10 a.m.-5 p.m., Sun. to 4 p.m. Discover the amazing talent of the Tri-State area with painters and potters, jewelers and photographers, plus woodcarving, glass, sculpture, crochet, knitting, mixed media, plein air painting and metalworks. Depot Park, 91 Bouthillier St., Galena, Ill., (563) 581-6225, arrtalongtheriver.com. Oct. 18-Nov. 10, Thu.-Sat., see website for times. When conservative candidate Therm Pooley’s criticism of Kerr’s government-sponsored performance art lands him a Senate seat, Kerr seeks revenge. [usual]Suspects, Nordlof Center, Rockford. Info: rockfordpubliclibrary.org. Oct. 19, 7:30 p.m. The musician portrays the history of the ukulele through song. MPAC, Mendelssohn Hall, Rockford, (815) 964-9713, mendelssohnpac.org. Oct. 13, 7:30 p.m.; pre-concert talk by the music director at 6:30 p.m. Featured are works by Saint-Saens, Wagner and Dvorak. Kishwaukee Symphony Orchestra, NIU Boutell Concert Hall, DeKalb, Ill., (815) 756-3728, kishorchestra.org. Oct. 24, 8 p.m. The architect of “shock rock” brings to the stage dark and horror-themed theatrics. Coronado PAC, Rockford, (815) 968-0595, coronadopac.org. Oct. 24-Nov. 3, see website for times. Robert Louis Stevenson’s story of a London lawyer who investigates strange occurrences between his old friend, Dr. Henry Jekyll, and Edward Hyde. Stage Coach Players, DeKalb, Ill., (815) 758-1940, stagecoachers.com. Oct. 27, 7:30 p.m. Features pianist David Syme, with music from Prokofiev, Rachmaninoff, Tippett and Paul Ben-Haim. RSO, Coronado PAC, Rockford, (815) 965-0049, rockfordsymphony.com. Oct. 31, 7 p.m. Originally performed in 1938, the radio drama simulates a live broadcast, with news flashes and eyewitness accounts of the alarming invasion by Martians, first in New Jersey and then across the U.S. and the world. Stage One, JPAC, Janesville, (608) 758-0297, janesvillepac.org. Nov. 2, 7:30 p.m. Winner of 6 Tony awards, the Broadway musical is a universal tale of fame, fortune and all that jazz. Coronado PAC, Rockford, (815) 968-0595, coronadopac.org. Nov. 2-4 & 8-10, Fri.-Sat. 7 p.m., Sun. 2 p.m. When the housekeeper of Elzbeth and Arlene Marcus disappears, these friendly and eccentric witches in south Texas enlist the help of the sheriff. In the meanwhile, closets fly open, barn owls spy through the windows and the house itself seems alive. Janesville Little Theatre, 906 W. Racine St., Janesville, (608) 756-4172. Nov. 3, 7:30 p.m. Australia’s premier classical-crossover group’s repertoire includes songs by classical composers and contemporary artists. Egyptian Theatre, DeKalb, Ill., (815) 758-1215, egyptiantheatre.org. Nov. 4, 3 p.m. Lecture at 2 p.m. Returning for their eighth season, the quartet features works by Mendelssohn. MPAC, Mendelssohn Hall, Rockford, (815) 964-9713, mendelssohnpac.org. Nov. 5, 2 p.m. A longtime Monroe tradition, this program features an afternoon of Green County’s finest Swiss folk choirs and performers. Turner Hall of Monroe, 1217 17th Ave., Monroe, Wis., (608) 325-3461, turnerhallofmonroe.org. Nov. 10, 7 p.m. Chip Messiner’s vocals are a remarkable match for the legendary singer/songwriter. Spring Creek UCC, Rockford, (815) 877-2576, springcreekucc.org. Nov. 10, 7:30 p.m. John Borling, Maj. Gen., USAF (ret.) narrates to the music of Copland and Haydn; with the Mendelssohn Chorale. RSO, Coronado PAC, Rockford, (815) 965-0049, rockfordsymphony.com. Nov. 15-18, Thur.-Sat. 7:30 p.m., Sun 2 p.m. Having survived an elaborate wedding ceremony, five bridesmaids seek refuge from the ostentatious reception, spending the afternoon in a bedroom on the bride’s estate; a funny and touching exploration of the nature of sisterhood and men. Artists’ Ensemble, Cheek Theatre, Rockford University, (815) 226-4100, artistsensemble.org. Nov. 16, 7:30 p.m. This 10-member male a cappella group, which originated at Indiana University, performs classics, movie themes and more. Coronado PAC, Rockford, (815) 968-0595, coronadopac.org. Nov. 16, 8 p.m. From his debut on Comedy Central’s “Premium Blend” in 2005, Janesville native Lee has made a name for himself on “Last Comic Standing,” “New York Minute: 30” and VH1’s “Best Week Ever.” JPAC, Janesville, (608) 758-0297, janesvillepac.org. Nov. 30-Dec. 9, Fri.-Sat. 7:30 p.m., Sat.-Sun. 2 p.m. Annie is chosen to leave the mean Miss Hannigan’s orphanage and live with wealthy “Daddy” Warbucks, to promote his image. She convinces him to search for her real parents, which brings many imposters out of the woodwork. Stage One, JPAC, Janesville, (608) 758-0297, janesvillepac.org. This entry was posted on Friday, August 17th, 2018 at 11:58 am	and is filed under Arts & Entertainment. You can follow any responses to this entry through the RSS 2.0 feed. Both comments and pings are currently closed.